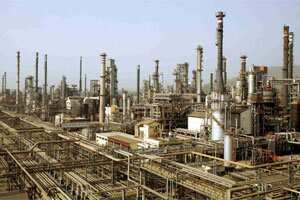 A view of Bharat Petroleum Corporation Ltd refinery is seen in Mumbai. Photo: Reuters. State-owned oil marketing company (OMC) Bharat Petroleum Corp. Ltd’s (BPCL) performance in the September quarter was disappointing. For the September quarter, BPCL’s revenue increased by 19.4% over the same period last year to ₹ 42,302 crore. However, there was no subsidy from the Union government in the September quarter as opposed to the June quarter. Analysts are not too worried, maintaining that the company will be compensated eventually as far as the subsidy is concerned. Operationally, gross refining margin (GRM), a key measure of profitability, has been weak for the September quarter compared with the June quarter. Reported GRM for the September quarter stood at $1.6 (aroundRs 78 today) a barrel compared with $2.8 in the same period last year. Refining margin is the difference between the total value of petroleum products produced by an oil refinery and the price of the input (crude oil). GRM in the June quarter, too, was higher at about $3 per barrel. Analysts say weak GRM in the September quarter can be attributed to inventory losses and reduction in custom duties. The company’s GRM is disappointing when one looks at the performance of the benchmark Singapore GRM, which has improved to $9.1 a barrel in the September quarter from $8.6 in the previous three months. BPCL’s stock fell 2.27% after the results to ₹ 623.25 on Monday, a day when the BSE benchmark Sensex lost 0.56%. Indian OMCs continue to be surrounded by uncertainty about sharing subsidy. A decline in crude oil prices could help in reducing the overall losses from selling fuel below cost and offer some respite.